We’d rather enjoyed our last trip to the AGU and had always hoped to go back some time but it’s a long and expensive trip from the UK especially without having access to JAMSTEC’s generous travel budget. Back in February, PEN had decided to propose a session at the AGU this year, and there was at least a strong hint that some financial support might be available to presenters. So we were mulling over the possibility of going back, when a few months later, both jules and I received separate invitations to present our work there in unrelated sessions. We’ve never both been invited to speak there in the same year, so this all seemed too good an opportunity to miss. We cleared our schedules (ha!) and arranged the trip, starting with a couple of months at NCAR. My invitation was to a new session which covered betting, financial markets and insurance as it relates to climate change. At least, it was new to me, possibly something similar has been tried in the last few years. It didn’t attract enough abstracts for a full session on its own, so was amalgamated with a long-standing session on climate model evaluation and interpretation. Jules was invited to a session on (paleo)-climate sensitivity, which also got folded into a larger session on cloud feedbacks. We also submitted a poster to the PEN session on combining paleoclimate modelling and data, which focussed on our new attempt at reconstructing the last deglaciation. Interestingly, I found a presentation I gave back in 2009 at a different meeting proposing this idea (and an acronym – 21kaRP), but we had too many other things on our plates at that time and didn’t pursue it further. It is much more timely now that PMIP is pursuing a coordinated experiment aimed at simulating this interval with state of the art GCMs. As well as booking our favourite hotel (surprisingly good value through the AGU site, especially with two people to share the room costs) we spent a bit of time surfing tripadvisor for the best places to eat, which threw up a number of old favourites and a handful of new places to try. As a result of our research we didn’t bother with lunch on the flight but instead headed straight to House of Nanking for sesame chicken after landing on Sunday afternoon, before heading off to registration to avoid the Monday morning queues. We didn’t find the schedule to be completely packed with must-see stuff, but there was enough to keep us interested most of the time. It’s not really sustainable attending lectures non-stop from 8am to 6pm anyway, though the remnants of a bad cold meant we didn’t have much energy for enjoying SF’s sights and shops. We had a few meetings arranged to do outside of the AGU conference itself, which kept us busy in some of the quiet times and made the whole week that much more worthwhile. Unusually, the poster session was particularly well-attended and useful. I think this was a fluke of scheduling, as there wasn’t much of a clash with anything except with Bette’s Emiliani Lecture at 11:20am. So basically everyone who was interested in paleoclimate went to the posters around coffee time and stayed for an hour or so, before heading off to the lecture which was great. It’s available though the AGU on demand streaming service, which doesn’t seem to have as much as in previous years, or perhaps I’m misremembering that. Anyway, several of the major lectures are available (the Schneider lecture by Battisti was another one that we attended), though not many of the normal short-talk sessions. My talk (here as pdf) was late in the afternoon. Being shoehorned into someone else’s session gave me some justification, I thought, in going beyond the narrow remit of my submitted abstract to talk a bit more generally about betting and betting markets. So I enjoyed a brief meander through a subset of the betting stories that have popped up in recent years. The AGU has gone widescreen (maybe years ago, but this is the first time we’ve bothered formatting for it) which is all very well but there was at least one room where a bit more attention could have been paid to ensuring that the image didn’t extend beyond the white screen, clipping off figure captions and titles. We made sure our text wasn’t too close to the edges and it wasn’t a problem for us. On Thursday, jules (to whom I had, just in time, successfully passed my cold) gave her talk, which had also been agglomerated into a larger session. This was a repeat of the Pliomip sensitivity paper, nothing that exciting to those of us who knew about this work though a good chance to talk about it with a new audience who mostly knew about cloud feedbacks and modern data and had relatively little exposure to paleoclimate. It actually clashed with a rather similar talk in a different session which I went to instead, so I can’t tell you how great it was 🙂 For lunch we penetrated the AGU editors’ lounge which serves much larger lunches than the EGU equivalent. The pretext for this free lunch was to discuss using paleoclimate to estimate climate sensitivity with some colleagues at least one of whom is, we hope, an AGU editor of some sort. We finished off the day with a dinner at Scala’s anyway, where I had a very good ribeye steak. By Friday we were a bit tired, and there was nothing that great on. We went to learn a bit about renewable energy which was quite fun, but it petered out towards the end. Didn’t have energy to go out for dinner so Pearl’s deluxe burgers had the honour of a second visit in the week. We also had plans for Saturday morning so weren’t really on for a late night. A few years ago we entered the AGU fun run and were caught in a downpour, which wasn’t actually all that much fun. Plus, the 7am Wednesday start time made it impossible to get back in time for the early session and we were particularly busy on Wednesday this year including the poster presentation first thing. Therefore we decided not to do it this time. 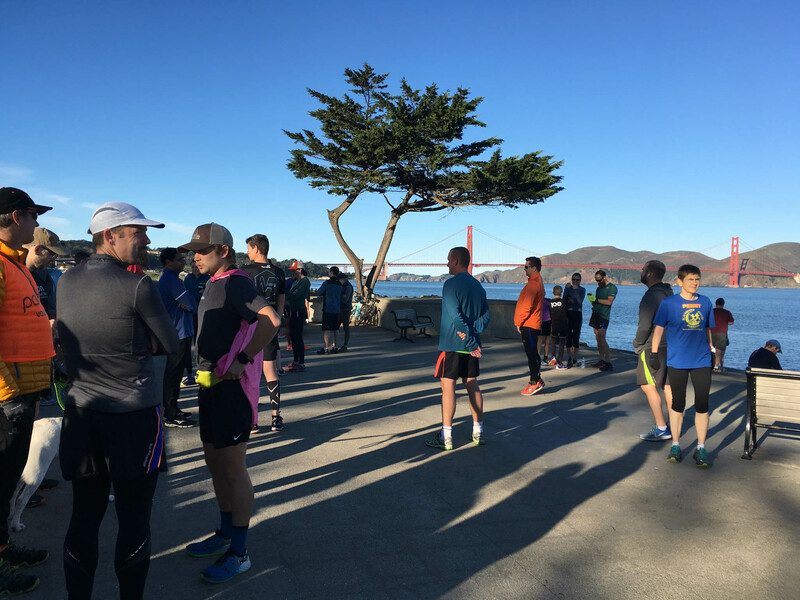 I had however spotted that there was now a parkrun on Saturday mornings at Crissy Field (one of only a handful in the USA). So we booked an afternoon flight back to Denver, and planned to take part in this, at least provisionally depending on the weather and how we felt after a week of AGUing. As it turned out, after a fairly wet and drab week for the conference, Saturday morning dawned sunny and perfect, so we greatly enjoyed a quick trot up and down the shore with great views of the Golden Gate Bridge and all the rest of it. By chance it was the 100th running of the event, so there was perhaps a larger than average turnout and even cake at the finish. So that was quite a treat to end the trip with. The return flight was then heavily delayed due to another snow storm in Denver, and when we finally got to Boulder we had to trudge back home from the bus stop late at night through several inches of snow with temperatures of -20C which was a bit of a shock to the system. I don’t think I would much like to live in Boulder long-term, it’s a struggle to go outside in those conditions though I suppose some must enjoy the skiing. Next year the AGU will be in New Orleans, then Washington DC the year after, while the Moscone Centre is being renovated in some way. Doubt we’ll be at either of them, but you never know.